Andrea is a doctoral student and is interested in comparative primate evolution mostly from an osteological perspective. Current research projects focus on testing variability selection hypothesis in old world monkeys, focusing on the particularly populous extant taxa like rhesus macaques and vervets. Dissertation work includes documenting variation in developmental pace, body size, diet, and geographic diversity in Macaca. She is also a collaborator in the Vervet Ethnoprimatology Study in St. Kitts, documenting similar variation in these adaptive monkeys. 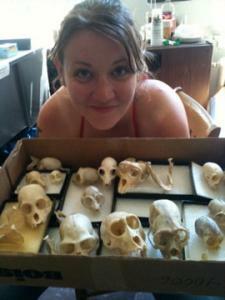 Andrea is the Assistant Curator of the UO Comparative Primate Collection housed in Dr White’s Primate Osteology Laboratory, which includes collection maintenance, managing students and volunteers, and supervising multiple research projects currently underway on the Collection. Andrea also conducts ongoing behavioral research at the Oregon National Primate Research Center, and she presented work in the Bones and Behavior Symposium at the American Association of Physical Anthropologists’ Annual Conference in 2013.